Disclosure: This post was sponsored by BODYARMOR as a part of the Mom It Forward Influencer Network. Hiking has become my outlet. It is the time that “Mom” gets to get out of the house for a few hours. It is my chance to get outside and enjoy the therapy that is nature. I’ve been on quite a few hikes over the last few years as my goal is to go hiking at least once a week. Hiking is an activity that can be done alone, with a group of friends, or with your family. If you would have asked me several years ago if I enjoyed working out I would have looked at you like you were crazy. I mean, who enjoys working out? The only reason why I enjoy working out today is because I finally found activities that motivate and get me excited about working out. Going to a stuffy gym is not my idea of fun, however get me on a trail wandering through a dense forest and then we are talking. However, if you have done any amount of hiking, you may have seen people walking around with backpacks. Have you ever wondered what is in those backpacks? Today I’m sharing with you a beginners guide to packing your backpack with essentials for hiking. These are 10 items you will want to have with you when you hit the trail this summer. A cell phone is one of those extremely important items on the list for the simple fact of emergencies. If something were to happen, you are going to need your cell phone to get help. Besides emergencies, I guarantee you will stumble across something on your hike that you will want to remember. So taking photos is another great reason to carry a smart phone with you. Also before you begin a trail, take a photo of the trail map, that way if you have no internet service in the woods you will still be able to find your way on the trail by reading the map. One of my favorite aspects of hiking is visually seeing how far I walked on a map. With a fitness tracking device like an Apple Watch or FitBit you can see just how far you walked and for how long. Using this visual is great motivation to push you to go even further the next time you hit the trail. 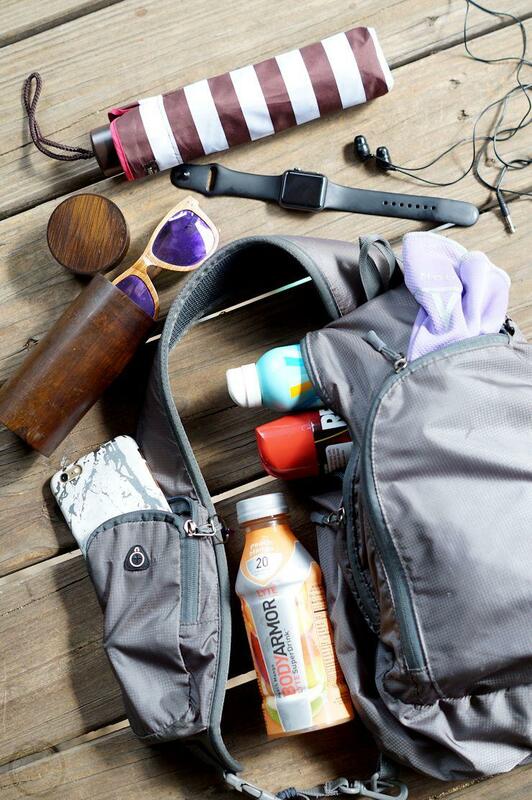 Besides a cell phone the other extremely important item to bring with you on a hiking trail during summer is hydration. The summer months can be extremely brutal heat wise so it is very important to pay attention to your health. You absolutely NEED to stay hydrated while on the trail. You also need to pack and carry with you enough liquid to keep you hydrated because there are no water fountains or any place to find a drink when you are in the woods. BODYARMOR LYTE, unlike regular water, contains electrolytes and vitamins that your body needs while hiking without being high in sodium. BODYARMOR LYTE, high in potassium, is made with coconut water, natural flavors and sweeteners with only 20 calories per serving. I like that BODYARMOR LYTE is a sports drink that isn’t some weird, neon color made from an artificial source. With the variety of flavors that it comes in (Peach Mango, Cherry Berry, Blueberry Pom, and Orange Citrus) it is so easy to find a favorite. 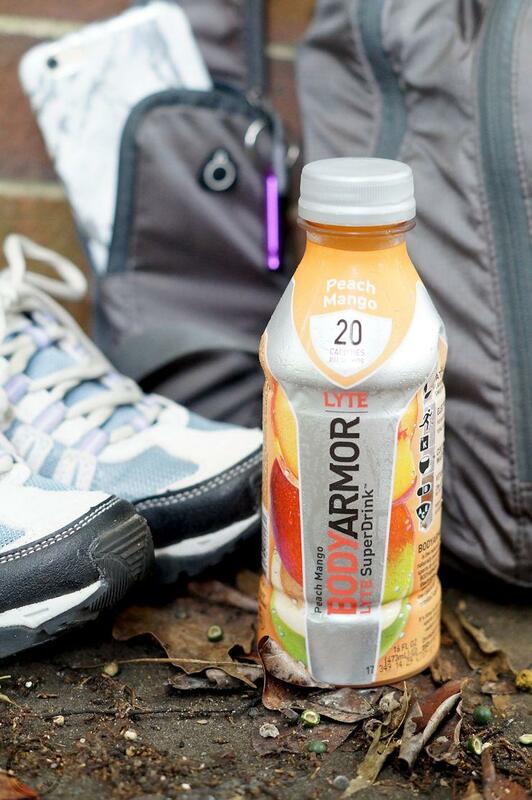 Want to try BODYARMOR LYTE? BODYARMOR LYTE is available in Kroger, Publix, & other popular grocery stores. Just don’t forget to print your coupon before you go to the store. Also, don’t forget when it comes to hydrating during the summer months, not only do you need to be prepared with how much liquid you bring with you while you are hiking on the trail but you also need to pack enough hydration for after you get off of the trail. Especially during the summer months, not only do I pack several bottles of liquid in my daypak but I also pack a small cooler for the car. When you get off the trail during the summer months you are going to want something cool to drink on your drive home so pack a cooler with icepacks and add a few bottles of BODYARMOR LYTE to have waiting for you in the car. You’ll be thankful for the cool drink after hiking in the heat. Speaking of heat, you need to pack with you ways to stay cool on the trail. The summer heat is no joke so listen to your body. I always like to pack a cooling towel in my hiking daypack. These towels are great when your body starts to heat up. You may have seen them in sports stores, sometimes they are referred to as Frog Towels. These towels you wet and then snap in the air to activate them. The towels feel cool and are great to drape around your neck or wipe on your face to help you cool down while hiking. You should always be protecting your eyes anytime you are out in the bright sunlight. Wearing sunglasses are a must on the trail, not only do they protect your eyes from the harmful sun rays but they also protect your eyes from being accidentally hit in the eye by a low hanging tree branch. There have been many times I’ve been hiking where I’ve been paying attention to where I was walking but didn’t notice a small, low-hanging branch. Having scratched my eyeball before, I’m so thankful that I was wearing eye protection. Bugs are no fun especially in the summer. Whenever you go in an area with a lot of brush, always protect yourself with mosquito and tick repellent. I cannot go in the woods without some sort of insect repellent on. Not only do you not want to get bitten but you also want to protect yourself from the potential diseases these bugs can possibly carry. I have very fair skin so anytime I am outdoors I have to wear sun protection. Often times people think they aren’t getting as much sun exposure as they are when they are hiking because they may be in a dense forest. It is always important to protect your skin from the sun’s harmful rays. Besides, dealing with funky sunburn post-hike is not a fun way to remember your hiking adventure. This may sound weird since I was just talking about the use of sunscreen however afternoon thunderstorms or rain storms can often pop up unplanned during hiking trips especially in the spring and summer months. For these occasions you will want in your backpack some way to shield yourself from the elements. A rain poncho is great if you want to protect yourself from the rain while staying hands free while an umbrella can shield you from not only the elements when it rains but it can also help shield the suns rays as well if you find that you need a little extra sun protection while you are out on the trail. Hiking takes a lot of energy so you are going to want to refuel that energy along the way. So packing a few snacks in your daypack are a must when hiking. Energy bars, trail mix, or even popcorn are all good options to have with you on the trail. Just be sure to pack something to eat with you in case you need it. As a busy mom, hiking is the time during the week that I dedicate to me. A lot of the times I just like to be outside enjoying the quiet of nature but other times when I hit the trail I also like to take advantage of that time to catch up on podcasts, or listen to an audiobook or my favorite music playlist. If you are just not feeling your hike for that day, listening to something can be an extremely great motivator especially when your favorite song hits so pack some earbuds in your pack just in case you need a little extra motivation out on the trail. I hope this list of essentials helps you when planning what to bring on your next day hike. I want to encourage you to get outside and explore with your family this summer. Many local parks have walking trails to enjoy. It is amazing how life changing a little hiking can do. Sunscreen is my top “must”! I also have to have snacks, water, and mosquito repellant. I usually pack a windbreaker/poncho, because they take up less space than an umbrella (and they’re hands free). You have provided a great list of essentials. I never go anywhere without my phone, Apple watch, and lately, mosquito repellant. This Texas humidity makes them come out in droves. Yes! We go on mini hikes with our kiddos every week and these are a lot of the items we bring along! Hydrating drinks are a must! It’s been too long since I’ve been on a good hike. What a great list to keep in mind! Yes! I’ve always wondered what hikers carry in their backpacks. I also carry sunscreen and insect repellent. I love your tips to stay hydrated, I will check out the drink you recommend, it sounds delicious and healthy. Yes, yes, yes to the sunblock, bug repellant, and drink. I would have never thought of a cooling towel. Great idea! this will be my go-to list for summer! I like to use the umbrella for the sun! So necessary with my fair skin. Really helps for added protection especially if you forget to reapply every 2 hours. Yes to all of it! Definitely cannot forget the sunblock! this is a great list! when hiking its so important to have all you need. What a great post with good info for hiking! Its nice to enjoy the great outdoors! I was just looking for natural electrolyte drinks. With a chronic condition and the Florida heat, I have to be careful outside, even for quick day trips. Great suggestions! Great list– sunscreen and bug spray are always must haves for us! Adding the others now! A hike sounds like good quality mom time! I’ve never seen that drink before, I will have to look for it. Sunscreen and bug spray are a must, as is a cell phone in case of an emergency. Thanks for all the helpful ideas! Oh yes, a bear whistle is a must for when you are hiking in a bear’s habitat. Great info! I can’t wait to go hiking again. Thanks for sharing.